Now available by the same author: Foot-Ball in Barcelona, The First Ten Years (1802 to 1902). Click for details. 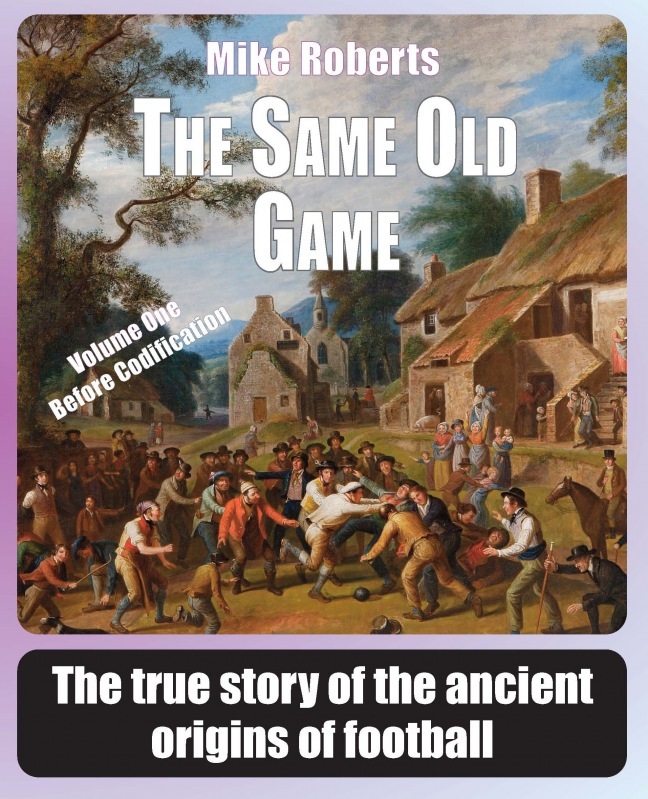 The Same Old Game by Mike Roberts tells the complete story of the origins of football. 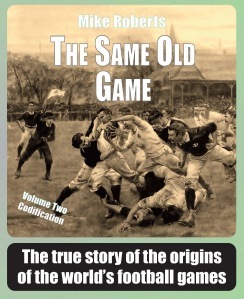 It starts at the very beginning, in prehistory, and explores the fascinating truths, theories and many misconceptions of the game’s development right through to modern times, and the creation of the modern codes of soccer, rugby union, rugby league, Gaelic, Australian, American and Canadian football. They may all be different now, but they all share a common ancestry. They are all basically The Same Old Game. Over two volumes, the book draws on the very latest research and revisits original sources to separates fact from fiction. The first volume, The Same Old Game: Before Codification includes detailed chapters to the historic ball games of the Far East, Central America, North America, Aboriginal Australasia, Ancient Egypt, Greece and Rome, of the Vikings, of the Celts, of Medieval Italy and France and of many more different cultures, showing that the idea of kicking or throwing a ball, or even hitting one with a stick, is something that is probably older than humankind itself and that nowhere on Earth can really make a valid claim to have invented the idea. But the modern game was shaped into its modern form in the British Isles, and that is where the first volume ends the story. It shows how an old folk tradition boomed as a popular pastime, not just at the public schools and universities but all aro und the country, and how by the mid 19th century it had become clear that there was a need for a more established set of rules. 1863, a unified code was never to be. The book explores how and why so many different versions of the same game arose. For a start, in Melbourne, Australia, the local footballers had already agreed to their own rules before the FA was even formed, and the game they created is still played today – arguably the oldest and most ‘authentic’ member of the football family. Back in Britain, the clubs that preferred a more physical game in which the ball could be carried were not convinced by FA’s kicking game. Instead, they formed their own association and developed the rival code of rugby. And there was yet more division to come with the infamous schism between rugby union and what became rugby league. But neither soccer nor rugby were always welcomed in Ireland, which was fighting to preserve its own separate identity. In defiance against these foreign games, the Gaelic Athletic Asso ciation was founded and devised its own set of rules. The story also takes us to North America, and shows how and why rugby was adopted in the United States but was soon changed into the different sport of American football. And not forgetting Canada, whose own game developed in a similar fashion to the American one, but never quite entirely. Did football really start as an ancient fertility rite? Did the Aboriginal game of marngrook really have anything to do with the origins of Australian football? Can we really be sure that such civilisations as the Ancient Egyptians, Greeks and Romans ever played something like football? Did European settlers in the Americas learn more than we might think from the native games they saw? Was Medieval ‘mob football’ really as anarchic as we have been led to believe? Was rugby actually based on an ancient Maori tradition? How much did the British public schools really ‘refine’ a crude folk custom? Why are there two different versions of rugby, and is rugby union really the more ‘traditional’ of the two? Why did the North Americans introduce so many changes to the rugby rules? What roles might French, Italian and other European games have played in the origins of football? Did William Webb Ellis really invent rugby by picking up a soccer ball and running with it? Is Gaelic football really based on any old Irish traditions, or was it a modern invention? Is Canadian football a version of American football, or would it truer to say it was the other way round? Could Australian rules football really have been based on the Gaelic game? Why the forward pass in American football, the rouge in Canadian football, the oval field in Australian football, the H-shaped goal in Gaelic football, the offside rule in soccer, the scrum in rugby union or the six-tackle rule in rugby league?